Living in the backwoods of Colorado, you come to expect a few wild bear sightings every once and a while. What you don't expect, is for a big ol' bear to tiptoe into your driveway in the middle of the night, break into your car, relieve itself inside, and crash it into a mailbox, which is why a family was a bit startled to recently discover their Subaru ravaged in such a manner. Silly bear, cars are for people! While the animal fled before anyone saw it, the interior of the vehicle made it fairly obvious was responsible -- there were enormous claw marks across the dash, a bashed out rear window, and the radio and steering wheel had been completely torn off. There was also a steaming pile of bear poop left behind. 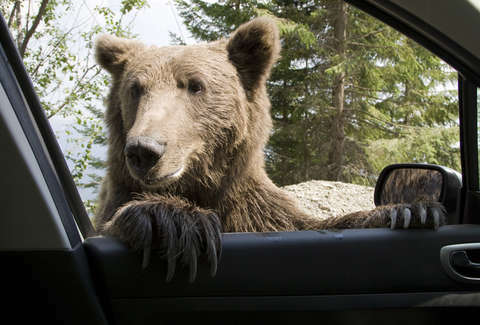 Police suspect the bear broke into the car looking for food, as there have been hundreds of local reports of bears rummaging through peoples' trash bins following a late-season frost that decimated the animals' natural food supply. They also believe the burly creature accidentally disengaged the parking brake, sending the car careening through various obstacles. It's assumed that the unexpected ride freaked it out enough to accidentally relieved itself inside. Something tells us Farmers Insurance is already working on adapting this into a commercial.